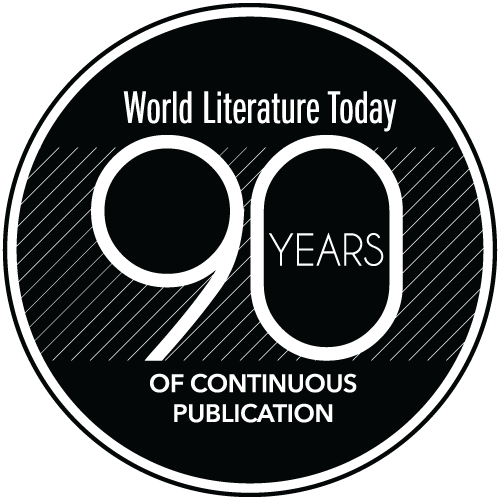 In the spring 1992 issue of World Literature Today, published to mark the quincentenary of Cristoforo Colombo’s encounter with the New World, Robert Berner writes: “The fact of the matter is that American Indian literature and the American culture of which it is a part are so entangled with each other that they cannot be separated. . . . Our achievement of a synthesis of the discordant elements of our consciousness—discovery of our ‘whole soul’—depends on recognition of the interrelationship of the Indian and European (and African) elements that has created America and the American consciousness” (“Columbus, Indians, and American Literature”). In 2017, twenty-five years after the five hundredth anniversary, those interrelationships, or entanglements, are as pronounced as ever. Moreover, American Indian literature is not confined to a single national narrative; Native writers have always been just as transnational as Douglass, Faulkner, Bishop, and Morrison. 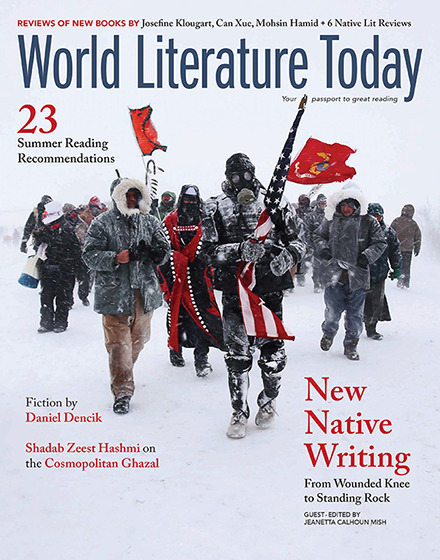 In his introduction to a new collection of essays by Gerald Vizenor, Elvira Pulitano, Shari Huhndorf, and other scholars, Scott Richard Lyons contends that Native American literature has, since the late eighteenth century, “been globalized from its inception” (The World, the Text, and the Indian: Global Dimensions of Native American Literature). In the New Native Writing cover feature that begins on page 34 of the current issue, guest editor Jeanetta Calhoun Mish has gathered the work of twenty-eight writers with tribal affiliations from throughout the continental US as well as Guåhån (Guam) and American Samoa. As Allison Hedge Coke writes in her marquee essay for the issue, the “colonial mad world” that Native writers confront in 2017 continually ignores the lessons of Mankato (1862), Sand Creek (1864), Washita (1868), Wounded Knee (1890), and other historical and cultural “entanglements” that have linked Natives and Europeans over the past 525 years. Echoing the “Water is life” mantra of the Standing Rock protesters, Hedge Coke argues that our collective survival depends on listening to the voices warning against ecocide and mass extinction. The sandhill cranes’ migration through the Platte River valley, she writes—an annual ritual that dates back nine million years—offers a model of integration we’d do well to emulate. In addition to themes of sovereignty and contemporary Indigenous identity, one of the predominant metaphors of the section is fluidity, especially the motion of bodies of water. That liquid metaphor is manifest in this fall’s “Gathering at Our Headwaters” theme of the twenty-fifth-anniversary Returning the Gift conference at the University of Oklahoma (October 8–11). Not just a literary conference, the gathering will include “live painting, art installations, reading events, storytelling, pedagogy discussions focused on Indigenous and tribal communities, film and screenwriting workshops, comedy sketches, environmental projects focused on water and land conservation, Native witness video documentaries, writing workshops, publishing industry workshops, and literary activism discussions” (rtglitfest.com). Kim Shuck, whose beaded Warrior Trout artwork has been chosen as the conference logo, is also included here in the poem “21st-Century Meditation” (page 49). Most of the authors featured here are part of the third and fourth “waves” of Native writers who have come to prominence since 1992. “Writers stream,” Hedge Coke writes. “We come together at gatherings, like the storytellers, singers, stimulated by knowledge bringers and gestured toward one another along waterways we call home. Whether you gather water from a river, stream, stone puddles, within plants, or in cupped leaves, you must have water to survive, and if you befriend the source you find an entire biosphere opens up within your view.” Going back to befriend the source is always wise counsel. May your own reading journey in the pages that follow bring you enlightenment, refreshment, and delight. Editorial Note: Special thanks to Jeanetta Calhoun Mish for her terrific work as guest editor and to Heather Ahtone, curator of Native American and non-Western art at the Fred Jones Jr. Museum of Art, for enthusiastically recommending several of the Native artists whose work enhances this issue.